I made this pirate flag cake for my nephew’s 4th birthday party this past spring. He was really into pirates at the time and this matched the party decorations perfectly. I used a 13 x 9 pan to bake the cake and then cut it into the shape of a flag. I used icing color to dye my icing black. After I iced the cake I used a toothpick to draw the outline of the pirate and bones and then used a star tip to fill in the colors. Writing his name on it was an added bonus and of course we used pirate themed candles for a finishing touch. This was a great hit with the kids and adults alike. 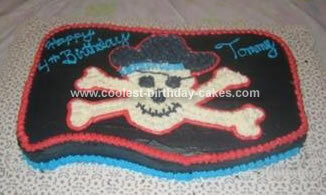 I drew the outline of the pirate skull in red to really bring it as the center of attention of the cake. I used traditional icing instead of whipped as it is easier to star tip with. Birthday cake idea posted by Tammy P.